Bangkok is known for religious sites, shopping, historic sites, nature, and nightlife. Your plan includes some of its best attractions: contemplate in the serene atmosphere at Wat Pho, explore the historical opulence of The Grand Palace, surround yourself with nature on a nature and wildlife tour, and admire the masterpieces at Bangkok Art & Culture Centre (BACC). For where to stay, maps, photos, and more tourist information, read Bangkok sightseeing planner. If you are flying in from Pakistan, the closest major airports are Don Mueang International Airport and Suvarnabhumi Airport. October in Bangkok sees daily highs of 38°C and lows of 30°C at night. Wrap up your sightseeing on the 9th (Sun) to allow time to fly to Chiang Mai. You'll find plenty of places to visit near Chiang Mai: Wat Phra That Doi Suthep (in Doi Suthep) and Doi Inthanon (in Doi Inthanon National Park). There's lots more to do: get a dose of the wild on a nature and wildlife tour, stop by Colour Factory, meet the residents at Elephant Retirement Park, and soothe aching muscles at some of the top local wellness centers. To find traveler tips, other places to visit, maps, and tourist information, you can read our Chiang Mai vacation builder. Getting from Bangkok to Chiang Mai by flight takes about 3 hours. Other options: drive; or take a bus. Traveling from Bangkok in October, expect a bit cooler with lows of 26°C in Chiang Mai. Wrap up your sightseeing on the 12th (Wed) to allow time to fly to Krabi Town. 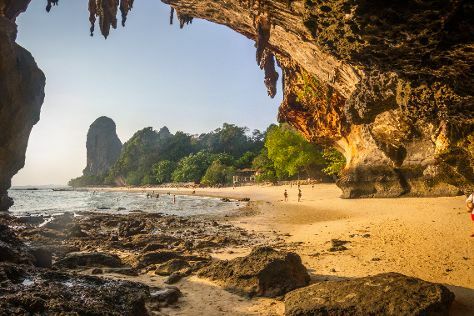 On the 13th (Thu), enjoy the sand and surf at Phra Nang Beach, hike along Railay Beach, get great views at Railay Beach Viewpoint, then look for gifts at de' MARCO Fashions, and finally enjoy the sand and surf at Ao Phra Nang. To see other places to visit, where to stay, reviews, and more tourist information, go to the Krabi Town itinerary planner. You can fly from Chiang Mai to Krabi Town in 2.5 hours. Alternatively, you can drive; or do a combination of bus and ferry. Expect a daytime high around 36°C in October, and nighttime lows around 27°C. Finish up your sightseeing early on the 13th (Thu) so you can go by car to Phuket Town. The economic hub of the eponymous island, Phuket Town attracted merchants from China, India, and Portugal long before it became a tourist destination. On the 14th (Fri), contemplate in the serene atmosphere at Wat Chalong, admire nature's wide array of creatures at Phuket Zoo, get outside with Sky Club Asia, then identify plant and animal life at Gibbon Rehabilitation Project, and finally center your mind and body at The Little Yoga Room. Get ready for a full day of sightseeing on the next day: discover the deep blue sea with a scuba or snorkeling tour, then contemplate in the serene atmosphere at Phuket Big Buddha, then brush up on your knowledge of spirits at Chalong Bay Rum Distillery, and finally surround yourself with nature on a nature and wildlife tour. To see more things to do, where to stay, ratings, and tourist information, you can read our Phuket Town custom trip planner. Traveling by taxi from Krabi Town to Phuket Town takes 2.5 hours. Alternatively, you can ride a ferry. October in Phuket Town sees daily highs of 36°C and lows of 27°C at night. Finish up your sightseeing early on the 15th (Sat) so you can go by car to Patong.